3 Things to tell your neighbors about Regionalism and the NEOSCC | This website is NOT affiliated with, funded, or in any way associated with the organization known as NEOSCC. 1.) Your next job may not be there. Who would you rather have decide about job growth – your local community, or planners in Cleveland whose first priority is “economic equity?” The NEOSCC’s plans will restrict job growth by trying to force new development and jobs back to the cities and away from the areas they are looking to expand. Most job creation takes place over 20 miles from the city center. Trying to restrict growth outward will chase away prospective employers or those that are here that need room to expand. These firms will simply move to another region that allows them to grow as they desire. Haven’t we already lost enough jobs to other parts of the country? 2.) Your next home will be more expensive if you can find one. NEOSCC discourages suburban expansion over high density, urban living. OK if that is how you want to live, but if you don’t, restrictions on new housing developments will drive up the cost of housing and its availability for everyone. It has in Portland and other places it’s practiced. And speaking of high density, who wants to live like this? 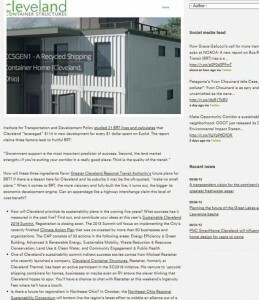 This is a suggested form of living, in converted shipping containers from the website GreenCityBlueLake. http://gcbl.org/blog/2013/09/how-grace-galluccis-call-for-more-transit-will-scan-at-noaca. , These guys are one of the influential board members of NEOSCC. The same article here promotes the NEOSCC and calls those who question it as “pushback from groups on the fringe.” So they promote living in metal crates and we are the ones on the “fringe? !” Do you want these guys in charge of planning YOUR future? As to how much, you won’t have a say. Your local elected officials won’t be in charge. . They want to expand the responsibility for failed urban programs on to the back of suburban and rural taxpayers. This entry was posted in Evidence, News on September 20, 2013 by alex.